Christopher Hamilton published an article at EURWEB about Michael Jackson way back in January 2006. After reviewing “IS IT BECAUSE HE’S BLACK? : What They Don’t Want You to Know About Michael Jackson”, I felt it was appropriate to post it here again. Hamilton states that Michael walked in the shoes that no black man had ever walked in before and how that is and was true. If you haven’t read it, enjoy, and if you have please review and remember what was. “What do you think of when you hear the name, Michael Jackson? Wacko? Criminal? Great Entertainer? Businessman? Whatever you think of MJ, throw all your thoughts out of the window and let’s examine some facts. For years the media has labeled him ‘Wacko Jacko’. What happened to MJ? Wasn’t he the biggest thing in music at one point? When did he go crazy? All anyone has to do is look when Michael started being portrayed as ‘Crazy’. It wasn’t during the ‘Thriller’ years. It’s cool being a song and dance man. That’s what they want. Don’t dare become a thinking businessman. Don’t’ dare buy the Beatles Catalog. Don’t dare marry Elvis’ daughter. Don’t dare beat the record industry at their own game. Michael started being labeled crazy when he began making business moves that no one had been successful at doing. Michael took two cultural icons and shattered them to pieces. All our lives, we’ve been bombarded with two facts. The Beatles were the greatest group of all time and Elvis was the King of Rock and Roll. Michael bought the Beatles and married the King’s daughter. (if that ain’t literally sticking it to the man) If I wasn’t a cynic, I’d say Michael did the Lisa Marie thing just to stick it to the people who consider Elvis the King. The Beatles were great, but they weren’t great enough to maintain publishing rights over their own songs. Elvis was great, but he didn’t write his songs. His manager, Col Tom Parker, was the mastermind behind Elvis… keeping him drugged with fresh subscription pills and doing all the paperwork. To ‘get’ someone, you have to attack what they love the most. I’ll say no more on that. The only man who even approaches MJ in taking on the industry is Prince and to a lesser extent, George Michael. They went after poor George Michael, publicly outing the man as a homosexual. Prince fought hard and made his point, but nevertheless still had to resort to using a major company to distribute his materials. There is nothing wrong with that. Prince would get the lion’s share, but the result were years of being labeled crazy and difficult. The greatest moment for them was the Sneddon press conference. “We got him.” Never was such glee so evident. Who cares if we have evidence? On the outer surface, it appears Michael is not doing anything to make money. Don’t even count the weekly sales of his CDs. 15,000 CDs a week is nothing for Michael. The Sony/ATV catalog is money for Michael Jackson every time he breathes. Serious money. The fact that no one reports on the actual amount is proof of that. They would rather you believe he is broke than tell you the truth. Neverland is still owned by MJ. The family home in Encino is still owned by MJ. Michael still owns the Beatles songs through the merger with Sony as well as full ownership of his own songs. But, hey, that’s our little secret. Michael Jackson is literally walking in the shoes that no Black person has ever walked in before. If he ever writes an autobiography, it will be one of the most interesting ever. A Black man with no real formal education becomes the most powerful man in the industry, despite hatred, racism, enemies in his own camps and a media willing to be bought to the highest bidder. If Sony had any sense, right now they should offer to continue the partnership. That’s the only way they will make future money off of Michael’s catalogue. Tommy Mattola did not lose his job with Sony because he was a bad label head. It was a casualty of war. MJ exposed him and Sony had to cut their losses. Companies do it all the time. Notice no one at Sony nor did Matolla himself ever sue MJ for slander. Michael always was loyal to his bosses at Epic/Sony. Back at the 1984 Grammys, he even brought then label head Walter Yetnikoff on stage with him at one point. He’s always thanked Dave Glew, Mattola and others at Sony in his acceptance speeches. Sony can still do right by Michael, but it may be too late. However, they still should make a goodwill gesture, but how many times do businesses do that? If I were them, I’d still want MJ as an ally, not as an enemy. It is/was a mutally profitable merger. I’d be scared as hell if I was an enemy of MJ while he is with the multi-billionaires overseas. Believe me, they aren’t just over there discussing designer clothing. A conglomerate is in the making. In the end, Michael won’t be known for being an alleged child molester. He won’t be known for ‘Thriller’. He will be known as the man that fought the record industry and won and lived to tell the tale. That is a book worth buying. Christopher Hamilton is a freelance entertainment writer. MICHAEL JACKSON’S THRILLER IS THE FIRST ALBUM CERTIFIED RIAA 30X MULTI-PLATINUM THE KING OF POP MAKES HISTORY (AGAIN)! More details on instrumental album Michael Jackson started before his death, and his love of classical music. TV and film composer and conductor David Michael Frank may have been one of the last persons to collaborate with Michael Jackson on an artistic project. The pop singer’s untimely death left that project in an uncertain state. Initial reports suggested that Jackson planned to do an album of “classical music” he had written; the pieces were to be orchestrated by Frank. Actually, Frank says, the pieces were closer to film music and would have gone into an all-instrumental album had Jackson lived. The Baltimore-born Frank, interviewed by phone in California, gives an account here of his experience with the King of Pop. Sony Corp. appears to be moving forward with plans to sell off its half of Sony/ATV Music Publishing, after recently triggering a clause in its contract with its co-owner, the Michael Jackson estate, that allows one party to buy out the other, according to people familiar with the matter. The world’s biggest music-publishing company, Sony/ATV is co-owned by Sony and the estate of the late pop star, who died in 2009. Mr. Jackson and Sony had jointly owned the company since 1995, with each partner holding a 50% stake. Willa: In late 2011, the Michael Jackson Academia Project posted two videos to YouTube analyzing Black or White and They Don’t Care about Us. Joie and I both thought they were interesting and well constructed – in fact, we liked them so much we published a quick post promoting them, even though we were both on Christmas vacation at the time. These videos were followed in February 2012 by two videos on the HIStory album, and again Joie and I thought they were thought provoking and well produced, and we encouraged others to watch them. NOTE from MJJJP- The information, quotes, comments, links and timeline below have been compiled and sent to MJJJP from a MJ fan Twitter Account – ItsBlackItsWhite– Their wish is to present this information and let the Michael Jackson fanbase come to their own conclusions regarding the issues and questions reaised in the entitled article and we are willing to oblige this request. John Branca; Was He Really Fired In 2003? If So, Was He Rehired? February 2003: A letter notifying Branca that he’s been terminated. For reasons no one has explained, the day date has been whited out and the address of the letter’s origin is vague. Since it says “HAND DELIVERED” we will assume that Branca received it. 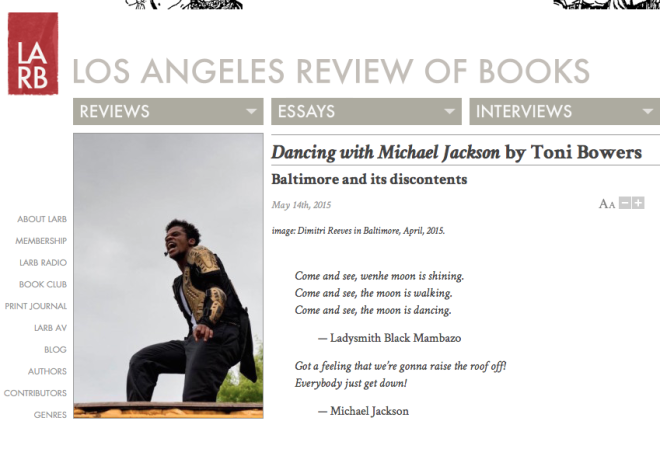 An amazing review/article has just been written by LA Review of Books – Bower’s look at the current racial inequities being highlighted in America’s legal system and how it relates to the way Michael Jackson was treated. It is very much worth a read and SHARE — the more the world is awakened to the injustices meted out on Michael Jackson the more they might realize why it happened and what was the reasonings behind it. Willa: This week I am so excited to be joined by D.B. Anderson, author of two of the most popular articles in our Reading Room. “The Messenger King: Michael Jackson and the Politics of #BlackLivesMatter” is an opinion piece published by The Baltimore Sun that places Michael Jackson’s activism within the context of the #BlackLivesMatter movement. And “Sony Hack Re-ignites Questions about Michael Jackson’s Banned Song” is a self-published article that went viral, becoming the most popular independent post in all of Gawker Media for 2014 – and it wasn’t even published until mid-December. Thank you so much for joining me, D.B.! D.B. : Thank you so much for having me, Willa! I’ve been reading Dancing with the Elephant for a long time and I always walk away with new insights, so it’s quite an honor to be here myself. Michael Was Right, Someone Was After His Catalog. What If It Wasn’t Sony Corp.?